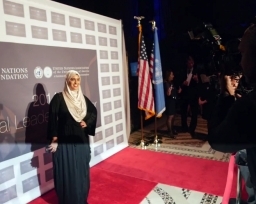 Rana Abdelhamid ’15 received a United Nations Foundation Global Leadership award. MIDDLEBURY, Vt. -- "Islam is a huge part of who I am and what I do every single day," says Rana Abdelhamid ’15. The New York City native and Middlebury Posse Scholar says that spirituality "provides me with the right intentions and the right motivation for the work I do." Abdelhamid says a violent episode from her youth, which she attributes to her being visibly Muslim, led her to launch her own program–at age 17–to help other young Muslim women find community and learn leadership skills and self defense. Her Women's Initiative for Self Empowerment, better known as WISE, was one of many projects she managed as an International Politics and Economics major at Middlebury. The program continues to thrive and she has big plans for its future. This video is part of a series exploring various ways in which young Middlebury alumni are applying their liberal arts backgrounds toward solving pressing global issues. Rana, continue to inspire! You rock!